Lead, Nickel & Cadmium Free! 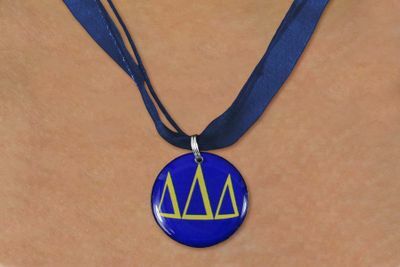 Your Choice Of Color Sheer Ribbon With Dual Cord Necklace Suspends YOUR Sorority's Colorful Greek Letter Disk Charm With Clear Epoxy Cover. These Are Custom Made For You! Be Sure To Use The Drop-Downs Below To Select Your Sorority's Charm And The Color Necklace You Want.